I just got back from taking the boys on a long walk, hoping that they will nap for a few hours (fingers crossed!). And as they nap, I am planning out my day. 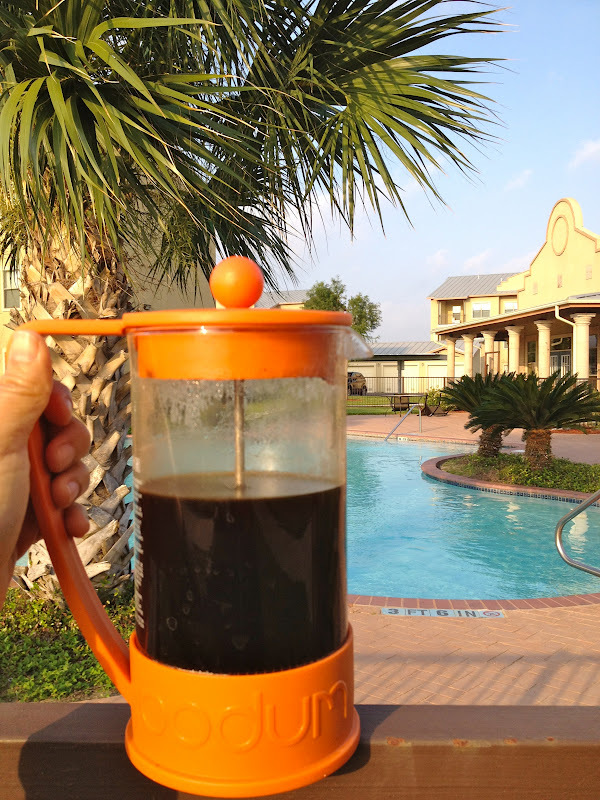 Starting with a little cafecito using my Tangerine Tango Coffee Press from Bodum. Is it just me, or doesn't everything taste better outside? Most of you have followed us throughout our many moves and although they are exciting, they also involve a lot of readjusting, re-inventing, re-packing. So our favorite prefix is RE! Which brings me back to my resume... It's so hard to talk about yourself. I know I do it to some extent on the blog but sometimes I wish people would just interview me and see how FAB I am! :) Until then, I will keep plugging away as CEO of sealaura industries. Wishing you a Tangerine Tango Day! Okay coffee outside with that view I would be in heaven. Thinking about a resume gives me lots of anxiety. I just thought about mine the other day. I never dreamed I would be a SAHM. Now I've been home almost 4 years, and I know once Boyd starts kindergarten, I will probably work again. I will be so lost re-doing my resume. Your coffee looks good, love the tangerine colors in your photos, and yes everything is better outside. Good luck with your resume. I will keep my fingers crossed for you. I have only made one major move in my life and that was hard even though it has given new experiences, friends and perspective. Tangerine is such a happy colour! Hope your day is productive and weekend fun. Looks like a perfect day~!